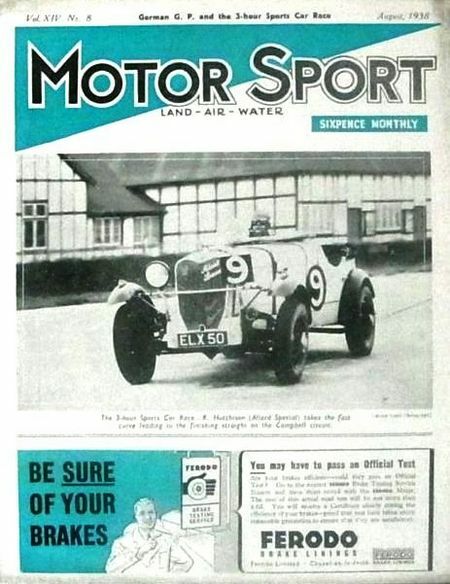 Today's cover is from the August, 1938 issue of Motor Sport...and it's probably the oldest magazine featuring an Allard on the cover. The cover caption reads, “The 3-hour sports car race…K. Hutchinson (Allard Special) takes the last curve leading to the finishing straight on the Campbell Circuit.” The Campbell Circuit at Brooklands was first raced in 1937, but the land was soon pressed into war service in 1939. The Lincoln V-12 powered ELX 50 was built for Ken Hutchinson. According to Tom Lush’s book, Hutchinson and Sydney co-drove the car ran “faultlessly” except for a broken fan belt that was fixed within five minutes. The team finished 9th overall, completing 74 laps at an average speed of 56.5 mph. Not bad for the Allards first real road race. Special thanks to Kerry Horan for sharing this with us. The Moss Files, Delivery Day.